I made this necklace during the recent historic rain storm. It isn’t my design but it was quick and easy and therefore relaxing, taking my mind off the deluge around my house. Before the storm I tackled the Roller-Bead Necklace from the October 2012 Bead and Button magazine. Now, THAT was a fun project. 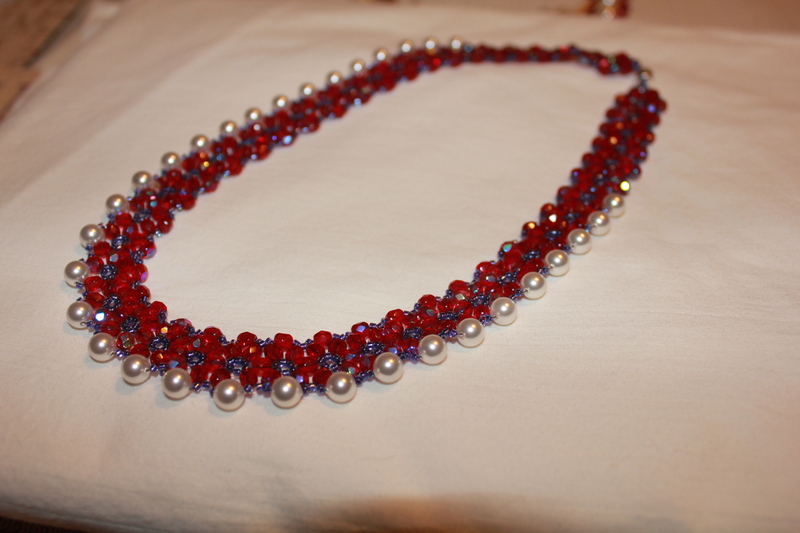 It would look great at Christmas with red/green/white or silver Swarovski crystals and seed beads. Essie is always happy to help me model my jewelry, although after a few moments she decided it was a toy. This entry was posted in Bead and Button magazine, beaded necklaces, Beading, Cats, Retirement Life and tagged Beadwork, Cats, Crafts, jewelry, Swarovski. Bookmark the permalink. What beautiful work! Working on crafts or art (Isn’t it all art?) is so good for the soul and wards off anxiety.